The game hasn't been addressed in an official capacity from LEGO publisher Warner Bros., but the folks over at Eurogamer have shared a little more potential info. 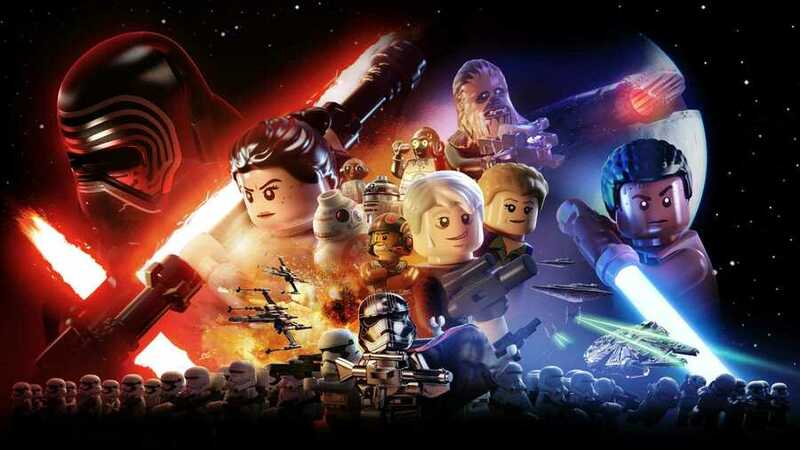 According to Eurogamer's sources, this next game will be "more than just an adaptation of the saga's remaining two episodes", following on from 2016's LEGO Star Wars: The Force Awakens, and while those two episodes will be included, the game will apparently "tell the story of the entire saga". Teasingly, Eurogamer says that it has been described as the "ultimate" LEGO Star Wars game. Naturally, we'll keep an eye out for any official confirmation for the game going forward; it'll be interesting to see whether or not this ends up on Switch. Great news! Lego games are always fun and my kids are starting to really get into star wars so this'll be a perfect holiday gift! i wouldn't be at all surprised, if this was coming to switch. i'd be more shocked if it wasn't. The LEGO version of episode 8 is going to really feel like unintentional parody unless they skip massive chunks of it. Maybe they’ll just go all in and have levels dedicated to Poe being yelled at, Chewbacca learning the joys of being a vegetarian and Luke having a battle with ghost Yoda. I would love it to include The Clone Wars levels and characters as they were my favourite Lego SW games. How reliable is Eurogamer? I mean they reported that Nintendo Gamecube games are coming to Switch virtual console right before the Switch launch. They lost credibility for me after that report. This will get lost in the press with Jedi: Fallen Order already having a release date. It is UE4 - Classic Nintendo If it gets the LEGO game but not the actual SW game everyone will be playing. So, 12 films and 3 TV Shows is literally the maximum they can cover, and I doubt they’d want to cover The Mandalorian so soon. Maybe for one of their many DLC Packs. Just make a game for the holiday special and I’ll be happy. Oh man a game with every LEGO Star Wars episode plus the last two films in it would be fantastic. It'll be hard to parody the parody that was episode 8. I imagine they never made a game just for Episode 8 because not much really even happened in it; even for 7 they had to include a bunch of additional content that wasn't in the film and that was way more eventful. @Orpheus79V Not sure what you are on about. Star Wars LEGO stages for Episode 1, 2, 3, 4, 5, and 6 had to add a bunch of additional content because... not much really ever happened in those movies, I guess. The LEGO games are full of additional and expanded scenes to give you tons to collect and stretch out the play time beyond the 45 minutes or so of action that any movie has. Turning that around into an attempted criticism of Episode 8 is really stretching, in my opinion. Honestly, I still prefer the original where platforming and puzzles were the focus and the art direction was voiceless comedy. The remakes left me a bit disappointed. Would love to see any future remakes include the original version of the original trilogy as an optional extra. Also, play into Rebels and cartoon series to appeal to the kids, much like they did with the clone wars. Or take it to the next level with SWTOR / KOTOR content. A Lego SW game spanning all nine episodes sounds pretty damn neat indeed. I'd like a complete saga but with better controls, it was always odd going back to play them. Except maybe the last one they made for consoles. Not sure if that was a part of the saga though. Personnaly, I'm a big fan of the earlier LEGO games, particularly LEGO SW complete saga. These games had focus, were tons of fun, and you were never lost anywhere trying to think about what you should do next. I think LEGO games are at their best when you don't need to explore too much, with moderately sized levels. Although I admit I had a lot of fun with LEGO Marvel super heroes (the first one). After that, I think the formula was kept mostly unchanged (more or less) and the games kind of became boring a lot quicker. Their recent outtings felt somewhat flat to me. Not bad, but not awesome. Just.... ok. If they can make a new one similar in tone to the complete saga (no open-world exploration crap), but with the last trilogy episodes added in, that would be pretty cool. @Realnoize I would love this as well, but unfortunately I doubt they plan to do away with the system of gameplay that's been getting them money. On the other hand, if this "new" game just ends up being an HD compilation of the last four LEGO Star Wars games, plus content from the four new movies and then some, I'd be actually cool with that. Please just give me Star Wars. I love Star Wars still, but fell out of love with Lego 30 odd years ago. JUST GIVE ME STAR WARS. I LOVED the Complete Lego Star Wars on Wii. I've never enjoyed a Lego game (including the Star Wars ones) as much since. The three trilogies, remastered as one product? I love the Star Wars Lego games! TFA on Wii U is great! @aaronsullivan Not to the same extent. There was a couple of bonus levels in the previous games but most of the levels were based directly on the movies' events, whereas TFA opened with the Battle of Endor and had a bunch of levels set between 6 and 7, like C3PO getting the red arm, Han and Chewie hunting the tentacle monster, etc. Which was neat and all but did show that maybe they should've waited for there to be a whole trilogy to work with like the previous games. LEGO Star Wars 3 Part 2: Clone Wars Continued... please? @backinthegame Well, there's always Jedi Fallen Order. This sounds great. Unless they do something to mess it up but I’m expecting a certain buy. If it covers all of the shows and films, I'm absolutely in. It will probably be Lego Star Wars: The Sequel Trilogy and it will likely release next year. I usually wait for Lego games to drop in price before I get them, the exception being The Force Awakens on the Wii U which I bought at launch due to the eShop having it priced incorrectly (was set to the 3DS price for the first day). If this one is actually the entire saga though then I might have to get it sooner. Always down for more LEGO, especially Star Wars! Not expecting this before the movie’s release, though that begs the question of whether we’ll see a different new LEGO game before then. LEGO Avengers 2 (coincide with Endgame)? LEGO Toy Story (when 4 releases)? I’d play either of those in a heartbeat. Lego Star Wars Jedi: Fallen Order? @Rhaoulos Possible to have content or characters in the game referencing it, but unlikely to include the plot or major elements from Fallen Order. @Jingo_Unchained I doubt Avengers 2 will be releasing any time soon. LEGO is releasing/just released a compilation of the first three LEGO Marvel games a la the method they re-released the LEGO Harry Potter games. @Jingo_Unchained I doubt TT Games had access to the plot, seeing as LEGO TFA didn't release until half a year after the film. At the same time, the LEGO Company itself clearly does have access due to the fact there are sets based on the film. If this was some general total package I'd think they'd need to have not just all 9 primary movies, but also some of those missing spaces in between like rogue one and clone wars that fill the gaps. Shadows of the Empire would be welcome but it's like stuck so not happening. @DFaceG_Rebooted True! I’m personally a little more hopeful for a LEGO Toy Story, though I’m not surprised if I’m in the minority haha. @Agramonte if past EA and LEGO games are anything to go by, this will be the better Star Wars game. @Orpheus79V Maybe just agree to disagree, here. It's not all that important. To me, the movies are the movies and judging them through evidence in a LEGO video game translation just muddies the waters. The original LEGO Star Wars games having "a few bonus levels" does not align well with my experience at all. Every small act in the film seemed inflated to a dozen screens of collecting studs, firing, jumping, and selecting the right character/ability on the pad with the right symbol. I would categorize the episode 7 additional canon stories as promotional additions to entice people back to these very similar games again, and, yes, also a way to reduce the stretching of small story events into long levels that all the previous games have done. New story is always better than recapping in any situation. You want to talk movies, that's an entirely different subject. @nopowerinthevers Still better to have the choice. I remember a crazy time when Star Wars was just three movies, some toys and a bad Christmas special. Yes please! My son and I have been playing through TFA on the XBO and loving it!